Clear Imaging is dedicated to providing our valued clients with the highest possible quality website services and online marketing products available on the web. As part of our ongoing commitment to quality control, we are proud to offer affordable SSL Certificate products and services that are not only the most secure possible solutions for your online business but they also give you and your customers, piece of mind. 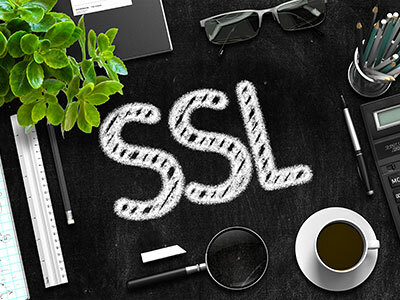 "SSL" stands for "Secure Socket Layer". An SSL Certificate validates your website's identity, and encrypts the information visitors send to, or receive from, your website. This keeps potential hackers from spying on any exchange between you and your website visitors. Example, when a visitor submits a form on your website, or makes an online purchase, their personal information is encrypted and parsed in a completely safe, secure manner. When you have an SSL Certificate protecting your website, your customers can rest assured that the information they enter on any web page is secured and cannot be intercepted by cyber hackers. Also, since late 2017, Google has stated that they will favor websites with an SSL Certificate in their search engine results. And if you use Google’s Chrome Internet browser, you will notice how they flag websites as secure or un-secure in the address bar. Our Standard SSL Plan does not support all Internet browsers but is compatible with most of them. It is recommended for smaller companies and individuals that have a minimal website presence and aren’t too concerned about their Google search engine rankings. If your website has good Google search engine rankings and you rely on this for generating business, or if you have an eCommerce website that transacts online purchases, our Premium SSL Plan is highly recommended and the extra cost is well worth the expense. We make it easy to purchase and install your certificate and secure your website with our affordable SSL Certificate Plans and options. If you’ve already purchased your own SSL Certificate from another provider, we can simply integrate it into your website for a one-time Installation Fee of $199. Other SSL providers such as GoDaddy, will sell you an SSL, however they will NOT install it for you. Nor will they redirect your website URL’s to ‘https://' which is crucial to ensuring your Google search engine rankings are not negatively affected. WHAT HAPPENS IF I DON’T HAVE SSL? Call us at 1-800-380-6942 to get started. Or log-in to our Support Ticket System and submit a request.